I have been using Antergos for a week or two now and I like it however I cannot seem to get the AMD RX 480 to work. Vague enough? Power runs to the GPU but there is no video output from the HDMI. Have read that there are issues with HDMI and AMD RXs. Also the system will not progress past grub screen with AMD GPU connected to power supply. Tried searching the internet but no relate-able search results. Hoping someone here might know what to do. Apparently I lack permission to upload, not sure how to work around that. The Mesa is at 12.0 and the firmware is up to date. It’s using at least Kernel 4.7.4. Motherboard BIOS is up to date also. 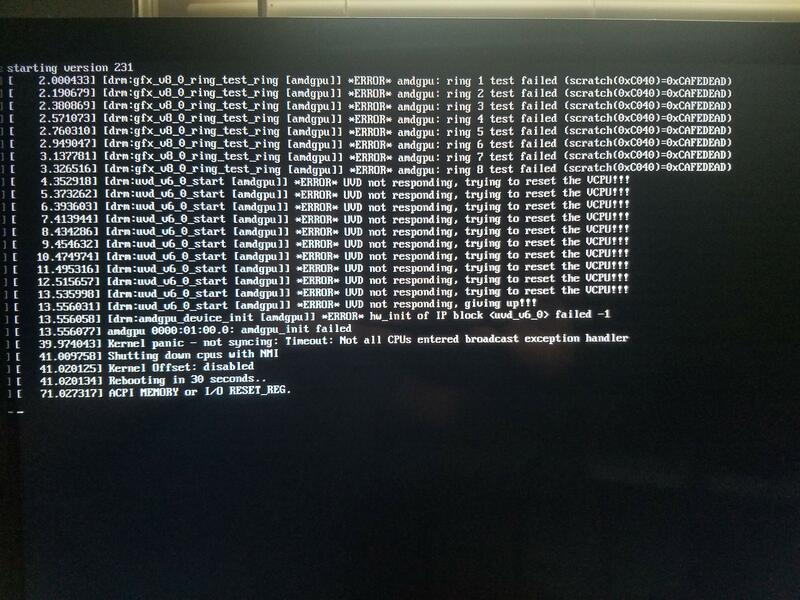 Attempting to boot with the GPU powered results in this error messsage. It constantly reads out the error then locks the system, up until today it only ever printed to “amdgpu 000:01:00:0 amd_init failed” While it does read that it will reboot in 30 seconds it is actually locked up. ran $ lsinitcpio -a /boot/initramfs-linux.img amdgpu module is included and made explicit. Added amdgpu module to mkinicpio.conf then regenerated. Tried following this guide RX 480 still not working. Have tried adjusting the mkinitcpio.conf file added amdgpu to moddules. amdgpu polaris10_dri drivers don’t seem to be recognized despite existing in the file. If i’m reading this correctly then it is has every driver but the amdgpu. Yet In /usr/lib/xorg/modules/drivers there is amdgpu_drv long with polaris10_dri I don’t know what I did but I cannot find the polarisxx_dri.so anywhere. This would explain a lot. Is there a way for me to download the drivers? Looking at the “depends” section and matching it with lsmod output my understanding is that everything matches. It doesn’t mention amdgpu but it does mention radeon and i915. I don’t know what to do about that. Attempted to reboot the system and it would not even get to the BIOS. No video output no computer beep, nothing. Anyone have any idea what should be done? I’m out of Ideas. Something went wrong. Got stuck in a login loop. Spent an hour attempting to find broken dependencies then i just moved .Xauthority and that fixed the login loop. Yay. Something went horribly wrong had to reinstall Antergos. Monitor would no longer be recognized by Xorg. Made a .conf for the monitor and it seems to work now.